Many PDA-fans who follow all the novelties of the mobile world and often change their devices said that most probably Asus A730 would be their next purchase. This pocket PC attracts by VGA-screen in spite of rather small dimensions, two expansion slots, bluetooth, nice design and new Intel XScale PXA270 processor, which realizes all potential of the high resolution screen. Will new model from Asus become a sales hit? We’ll try to solve this problem in the end of this preview. 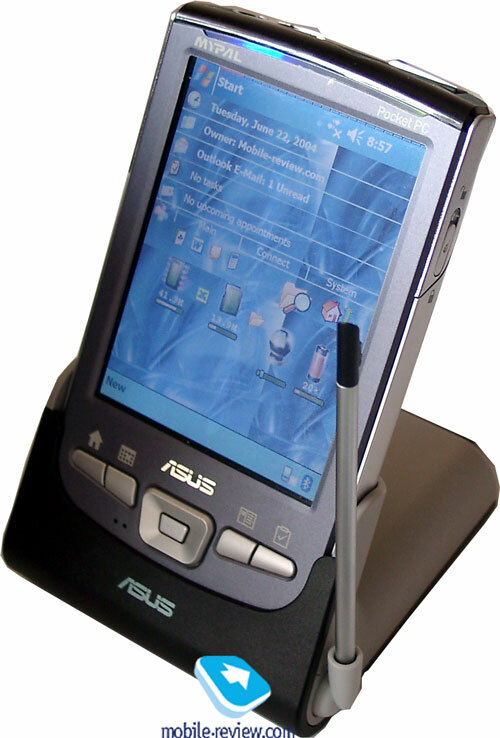 One half a year Toshiba e800 was the first Pocket PC which had a VGA-screen (640*480 pixels). Asus produced the second model of this kind (Asus A730), other companies will follow them later (HP, then Dell and Fujitsu Siemens). As we presumed PDA with such displays would be mass devices very soon on the market. In the near half a year-year namely availability of the high resolution screen will be a boundary between business and low-end Pocket PCs. No wonder that bluetooth adapters became a common thing almost in each low-end model. The next new tendency (the first time you will see it in the PDA from Asus) – the internal 1 megapixel camera. 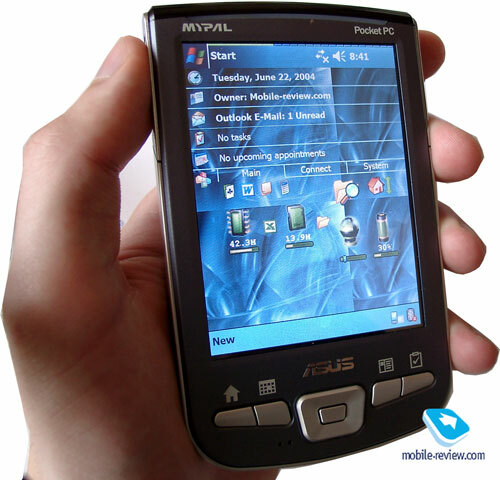 It will be typical for many PDAs produced in the second half of 2004, not only those based on Pocket PC platform. Though the index of the new model is very close to the previous one from Asus (MyPal A716), the new PDA is very different. It has absolutely new design, smaller dimensions, different screens, the version with internal Wi-Fi module doesn’t have the external antenna. MyPal A716 and A730 are similar only by two expansion slots and wireless functions. We can’t say that A730 is a successor of A716 because they have too much differences. MyPal A716 was a niche product focused to the small users’ group (its sales were not high, respectively). 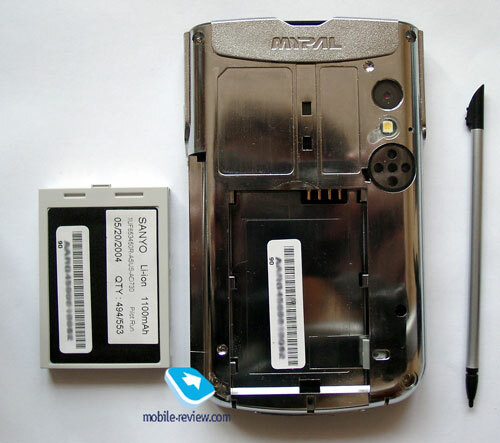 On the contrast, MyPal A730 is promised to be one of the best PDAs of 2004. 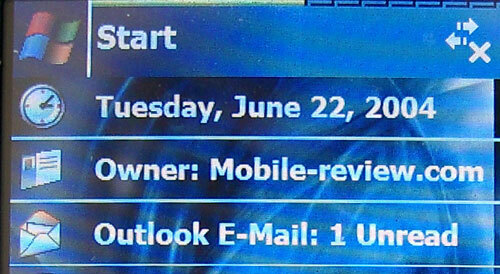 It was a preface, now let’s turn to the main part of the review. All those, who I spoke about A730 with, could be divided in two groups. People in the first group didn’t like the design at all, the second group, on the contrary, said that it was quite attractive. This handheld is not similar to PDAs from Asus we got used to. The classical angular design, silver plastic is absent. We can many curves on the body of this model. This Asus is more similar to HP iPaq, especially to iPaq 1940 - semi-oval bottom, thin double soft-keys. Look on the photos. Design is a personal thing and we can’t advice which one to choose. But pay attention that Asus A730 has its own face, it differs from other similar Pocket PCs by design. 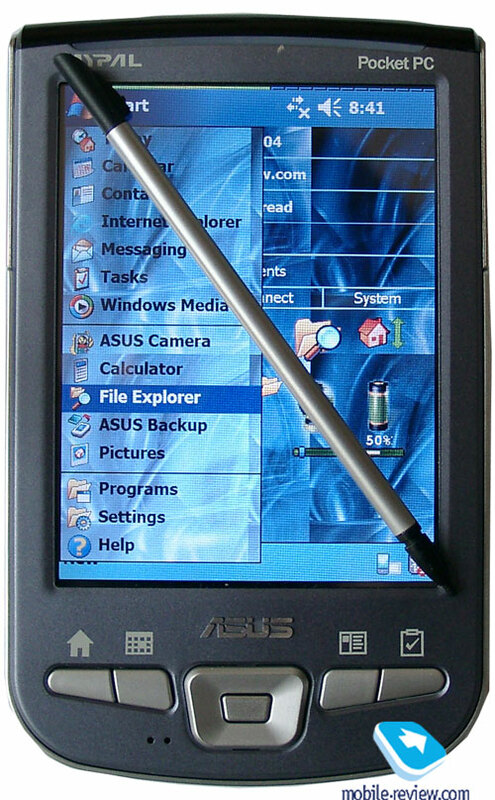 Asus A730 is much smaller by dimensions than Toshiba e800 – its main rival, and the future HP iPaq Explorer. It will be better to compare PDA with iPaq 19xx and 41xx series – one of the smallest Pocket PCs on the market: the length and width are almost the same, the depth is much larger – the payment for the second expansion slot. Toshiba e800: 134.6х76.2х15.2 mm 192 g.
HP iPaq 4150: 113.6х70.6х13.5 mm 133 g.
Asus A730: 117.5 х 72.5 х 16.9 mm 170 g.
The device is weighty but not heavy. The new device, which weighs 170g, wasn’t felt in the inside the pocket of the coat, but felt in the pocket of the shirt. So, the dimensions of this handheld with two expansion slots are close to optimum. Today it is the smallest handheld with VGA-screen, taking into account Sharp Zaurus and the future HP iPaq hx4700 series. The body of the model is rather controversial. The front edge of the screen is made of the qualitative dark-blue plastic, it is pleasant to touch, not slippery. The back cover and the sides are made of glossy silver plastic. There is no illusion of metallic surface and a little bit slippery. Probably the commercial version of the device will be made of a better plastic (we tested pre-commercial R&D sample), taking into account that plastic in the commercial Asus A620 was considerably improved compared to prototypes. Integrated microphone is located on the front panel under the keys, its quality is compared to rivals, it can record at the distance up to 1 meter. It is possible to use external microphone on the headset, which can be switched to the headset connector. There is a respective menu item in the settings. Look above the micraphone, there are standard soft keys and five-directional joystick. Keys are similar to HP iPaq 1940 by their shape, but they are soft. Navigational joystick is also soft and sometimes the center of it can be pressed by chance. After several hours of playing Anthelion (3D space simulator) we are sure that the keys and joystick are convenient for playing games. Several applications can be called by one key (short and long pressure). Rounded transparent lag with indicators is placed above the screen. The green light means the power supply, the blue light – switched bluetooth, Wi-Fi indicator will be added in the later version. Power key and camera key are located on the left side. They are placed deep in the device and couldn’t be pressed by chance. You should make an effort to press them. They can be compared with the key used to activate dictaphone in iPaq 4150. It is necessary to use stylus to move the key on the right side, an attempts to do it by finger or nail were failed. This key locks the battery compartment; the back cover can be removed. The stylus will be also necessary to take out the battery. This construction doesn’t look reliable, the backlash, scratch might be appeared after a certain period. The back cover didn’t have such problems though the battery was removed about hundred times. This peculiarity can be explained by the construction: we can say that the main part is almost included in the plastic frame and the will be no backlash. The camera lens, mirror (to take picture of yourself) and a loud speaker are situated on the back over of the device. Expansion slots (SD/MMC and Compact Flash), standard headset connector (3.5 mm), IrDa are located on the transparent upper part of the PDA. Soft-reset key, interface connector and stylus hole are placed on the bottom. USB devices (the keyboard, memory disks) can be also connected, the device can be charged through USB. Not standard stylus location caused changes of the dock-station. The developers added a stylus holder because otherwise you will not be able to take the stylus without taking the handheld out of the cradle. At first you forgot to take out stylus while putting the device in the cradle. The PDA stays tightly in the cradle. The handheld can be put their even with the extended battery. You can charge the device using cradle or directly, nevertheless you will need the cable for synchronization. On the whole, the cradle has no peculiarities. The metallic stylus has a plastic tip. It has optimum dimensions and rather convenient. The device is equipped with Li-Ion battery of 1100 mAh capacity. According to the manufacturer it provides up to 9 hours of work. It’s a pity that this model won’t repeat the record of Asus A620 (the declared battery life is 19 hours). It is explained by the increased display power consumption and smaller battery capacity. An extended battery of 1500 mAh capacity will be available for MyPal A730. We don’t publish the real working time based on field tests because they are far from real commercial version of the product, but we’ll do it later in several weeks. Active field of the TFT-display is 56x75 mm (3.62 inches across). It is capable to display up to 65000 colors, the screen resolution is 640x480 pixels. The screen is made using the same CG Silicon technology from Sharp as in Toshiba e800. But the dimensions of the screen are smaller in the model from Asus. Developers tried to find some kind of a compromise between dimensions of the screen and the handheld. Low level of the backlighting is comfortable to read text on the PDA at night, the text is also visible in not bright sunny days. Images can lose colors. Color rendering of the Asus A730 are the same as the Toshiba e800 has, viewing angles are not large; the information is comfortably visible at the angle of 45 degrees, not larger. We told about CG Silicon in the review of Toshiba e800, you can read this review to know more about it. To understand the differences between VGA- and QVGA screens, compare two pictures taken by different Pocket PCs (the upper left corner of the screen “Today”). When the number of pixels is increased in 4 times, it is much more pleasant to view photos, use GPS-navigation, view documents, use web-surfing, view video clips. It is nice when you have clear picture and fonts. MyPal A730 has 128 MB of RAM, about 111 Mb is available for user, though a typical memory for Pocket PC is 64 Mb. Flash-memory is not large - 19.22 Mb. The heart of the PDA is Intel XScale PXA270 processor running at a whopping 520 MHz. Almost all manufacturers of PDAs now try to use this kind of processor, that is why in the near future we’ll publish a separate article devoted to PXA270 processor and Intel 2700G graphic chip. We’ll try to estimate its potential and show its differences from other processors. Asus A730 is not the first Pocket PC with a new processor. 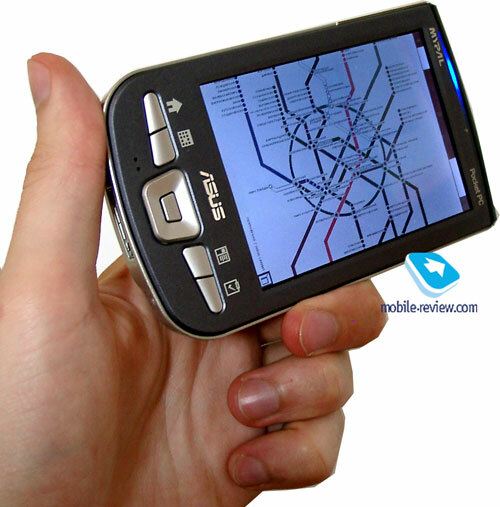 Dell Axim X30 was produced earlier but it had screen with the resolution of 320x240 pixels. To test the productivity of the device we used SPB Benchmark. Of course, we made just an approximate test because the productivity could be changed in the commercial version of the PDA. According to the test, MyPal A730 is a leader by productivity of the center processor. But the advantage is less than it is possible to presume. This index reflects the memory speed (reading/recording/replacement). Asus shows an average result, but it is a leader by the speed of coping large files. This index describes the performance of the built-in applications. It depends on the memory speed. The speed of synchronization is one of the highest for this PDA. This index indicates overall Pocket PC performance. You can say that Asus is slower than other PDAs in spite of the new processor, graphical subsystem. Let’s explain the reasons. Firstly, the results of synthetic productivity tests of the graphic are understated because of the external video card (Intel 2700G in this case). Secondly, the test was made in VGA-mode, though tests of other PDAs, including Toshiba E800 were made in QVGA mode. 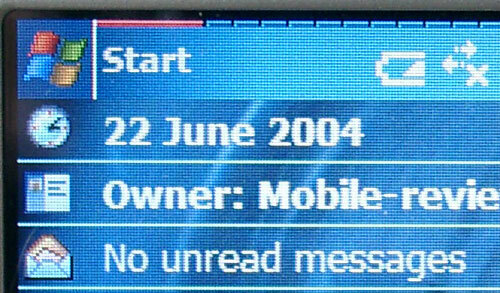 The test is intended firstly for PDAs with the resolution of 320x240 pixels. At last, engineers could optimize the system better in the commercial sample. Other tests either not loaded or worked incorrectly. We also tested the video using BetaPlayer 0.04. The results are in the table below. The speed is shown in percent, the higher percent is, the higher PDA's speed is (100% and more – video is produced without losing shots). We won't comment this result now, let's wait for commercial sample of this PDA and then return to this question. Anyway we are waiting for software players optimized for Intel 2700G graphical chip. It is the end of the first part of the review. We’ll tell more about internal camera, OS and bluetooth in the next part of the review. Also we’ll make some conclusions there.